"Finally! A book about boards that isn't boring!" "Everyone wins with good governance--countries, corporations, and community groups. In a compelling style like no one before him, Jim Brown helps leaders understand the keys for boardroom excellence. 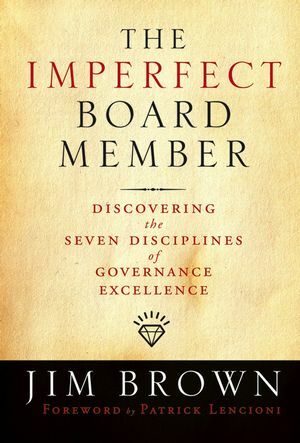 The Imperfect Board Member ought to be required reading for people on every type of board. The great thing is that it won't need to be required--it's such a fun book, every leader will want to read it." "I know no board members, myself included, who won't learn valuable lessons from Jim Brown's book The Imperfect Board Member. Don't miss it!" "Thanks to Sarbanes-Oxley, boards have become active. The Imperfect Board Member clarifies sharply the lines of what boards need to do and what management needs to do. The time has come for the two groups to work together and yet keep independent." "The Imperfect Board Member by Jim Brown is a highly perceptive, eminently readable, engagingly human book on how boards and directors can improve their performance. In a breezy conversational style that uses dialogue invitingly and often, the author explores with sensitivity and a light touch not only the standard ingredients but also the more subtle nuances of excellence in both corporate and not-for-profit governance." --William A. Dimma, author, Tougher Boards for Tougher Times; chairman, Home Capital Group Inc.
Jim Brown is a founding partner of Strive!—a leadership development firm that specializes in governance. With offices near Toronto and Cleveland, Strive! provides coaching and consulting services to boards and leaders across North America and in various countries around the world. Brown's seasoned wisdom and inspirational support have made him a trusted coach for leaders, and a sought-after speaker. Contact him at www.strive.com. 2. A Glimmer of Hope. 5. Unraveling from the Inside. 6. Rebuilding from the Ground Up. 7. One Step Forward, Two Steps Back.